This is the fifth post in a series of yoga stories from readers. Tell us how yoga changed your life. I have been living with Sarcoidosis for three years. 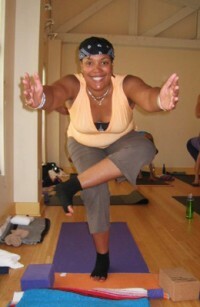 It has caused scarring on my lungs and prior to practicing Baptiste Power Vinyasa Yoga, I only had 40% lung capacity. At first my practice was very difficult. I could not breathe or focus on my asanas. It has been just a little over a year and I have reached so many milestones upon my mat. I am in remission and have begun to reduce my dependence on medications to get through the day without pain. I am stronger now at 45 than I have been my entire life. Although I have not conquered my disease, yoga has taught me how to set my intention, breathe and just be! What is the most important aspect of Hariata's yoga journey? Difficult to encapsulate, but watch her on video, and you'll see it. She's an absolute delight. There's a joy about her and a lightness of being.